Can I just tell you friends that I am in desperate need for a morning makeover! I feel like every morning I’m waking up frazzled and behind. To be honest, I think the word “behind” accurately describes my life right now. I’ve been wanting to make a change in my schedule, but frankly haven’t the energy to figure it out, and really I’ve been in desperate need of some serious hand holding. Anybody else feel the same way? Well, it’s funny how God works, and brings just what you need when you need it. I think it’s no secret that I’m a huge fan of Crystal Paine from MoneySavingMom.com, I may even go as far as to say I have a teeny, tiny mom crush on her. I discovered her website when Emma, now 6, was just a few months old and I was a new stay at home mom trying to make my husbands income stretch. I have learned so much from her about making your dollar stretch, reducing my expenses, making time for me, and so very much more! One of the many things Crystal is very disciplined at is time management, and starting her day with a plan. 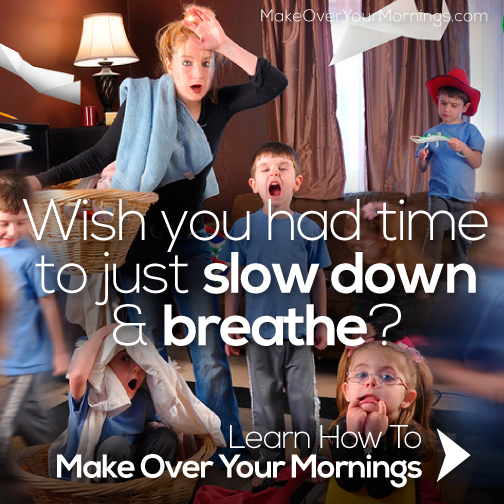 She has created a 14 day online course called Make Over Your Morning to help those of us who constantly feel rushed, stressed and behind (before we even get out of bed) to take charge of our mornings and start waking up with anticipation and not dread. This is exactly the hand holding I’ve needed! I have had the privilege of reviewing the course ahead of time so I can share it with you, and let me tell you it is awesome! It’s short, and manageable. I was so excited to see that it’s only 2 weeks long. I don’t know about you, but when something is 30 days, my immediate thought is “ya, I’m totally going to fizzle out half way through.” But 2 weeks, I can totally do that. Each day includes a short video (5 min max), a short chapter (5 min), and a project, or homework (5 min), so in total, you’ll spend 15 minutes a day making over and breathing life into your morning! Friends, I can’t tell how life changing this can be for you. The exciting news is Crystal is celebrating the launch of her new Make Over Your Morning course by offering a flash sale tomorrow, June 2nd! 5 p.m. to 12 a.m. – Only $13! June 3rd the price will go back up to $16.99 so get in on this awesome sale and make a change not just for you, but for your whole family! If you’re as exhausted as I am, you need a morning makeover as much as I do! *This post contains affiliate links. I recieved a free copy of the course for review purposes. All opinions are my own. Sorry I didn’t get up the weekly frugal accomplishments last week. I got sick Thursday evening and didn’t recover until Wednesday of last week. The kiddos are still sick, but I think we are on the better end of this, and will soon be back to normal. So for this weeks frugal accomplishments I’m going to cover the last two weeks. Last week I didn’t have the energy to do much of anything, let alone be very frugal, but I got a few things done. Collected rain water to use on the flower beds. Purchased some items from an online action for a much reduced price. Some items were needed, and others we intend to clean up and sell for a profit. We are hoping to make this a small side income for our family so we don’t have all our eggs in one basket. Wish us luck. Our homeschool group was canceled the last two weeks so that saved us the gas to make the trip to town. I had my husband shop for groceries while he was in town for work saving us gas there as well. We try not to make a trip into town for just one thing. I have been trying to be diligent to rinse out cans and bottles to recycle. It’s often easier just to through some of them away because I didn’t get things rinsed right away and it can be a pain to soak them and then rinse them, however our town participates in recyclebank.com so we receive a point for every pound of of recycling they pick up. You can then redeem the points for discounts, magazines, and even gift cards. I’ve redeemed several magazines, and when they are available, Amazon gift cards as well! The great thing is, even if your city or recycle company doesn’t participate you can still create an account, and take little questionnaires or read through info and earn points that way. I’ve been earning and redeeming points for years, but have only been participating in their recycling program for about a year and a half when our town switched companies. I hung out clothes 4 days over the last two weeks. Our power went out at midnight Friday morning (April 3rd) and didn’t come back on until the evening. It went out again Saturday morning around 10am or so and didn’t come back on for several hours. We had a micro cell that came in for a few minutes and then was gone, but it did a lot of damage through out the entire county. We were fortunate to have no damage, just the inconvenience of having no power while you have sick kids who want to watch a movie, but we managed. We were able to get some ice for free to keep things cool. I put a bowl of ice in our frig and just kept the freezers closed. I threw a heavy blanket over the deep freezer just to be safe though. Our ice cubes in our frig’s freezer didn’t even start to melt. I think it helps that we keep our house cooler in the winter/spring months as well. We didn’t need to get take out. We made scrambled eggs on the grill, and I had Joel cook up some hotdogs for lunch while he was cooking the eggs since he was going into town over lunch and I wanted things to be as easy as possible while he was gone (don’t forget I had three sick, slightly cranky girls to entertain.) I did have him pick up paper plates, disposable diapers and wipes, and a few staples items, but the staple items I was planning on him picking up before we woke up to no power. We did have hot water since our water heater runs on gas, but I was still only functioning at about 75% and, of course, taking care of three sick girls, and I needed a little extra help and the disposables did the trick. We had a busy Easter Sunday since our church was hosting the community sunrise service and breakfast. Joel was running sound/media, and I was singing on the worship team, so we had to be there extra early, like 6am. So we arranged to have the kids spend the night at Joel’s parents so we only had to be up by 5am instead of 4am if we’d had to get the kids ready as well, plus really, who want to get little kids up at 5am and deal with the consequences of that all day, maybe even week. We got our breakfast to go and headed over to Joel’s parents’ house between services to get the kids ready and then headed back. It was a blessing to not have to worry about breakfast. It was a great Easter service, and thought I was terribly tired by the time it was all done, it was worth it. So what are your frugal accomplishments from the last week? 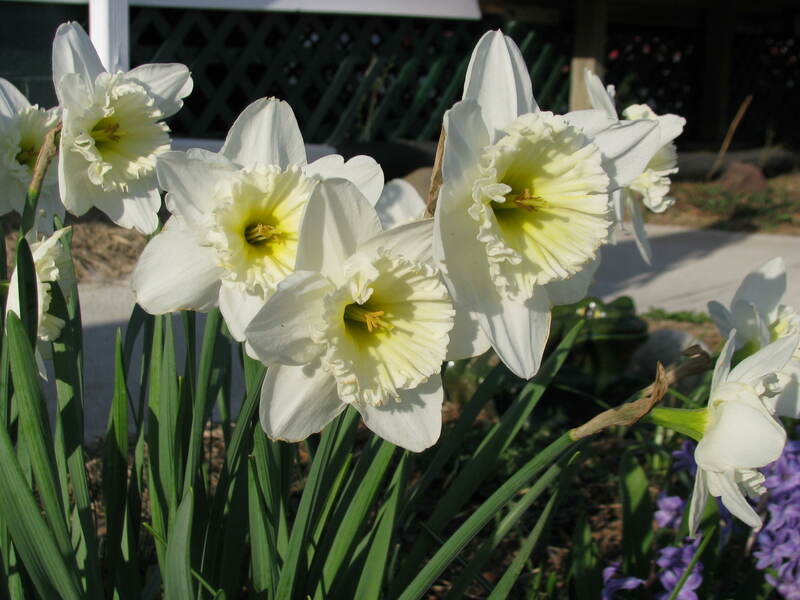 These are my grandmother’s daffodils. I’d like to give you a look into my previous weeks frugal accomplishments. This is to serve as encouragement and inspiration for you as well as me. I plan to attempt to do this on a weekly basis. Sometimes we need to take a moment and reflect on our week in order for us to find the strength and will to stay the course. I think frugal habits are a good thing to have and practice at any stage in life, but there are many, myself included, where they are a necessity right now, and I want us all to remember that we are not alone. God is not only providing for our needs, but also the creativity to stretch what we already have to make the most of it. I would like to encourage you to take a few minutes and share your frugal accomplishments in the comments below. We all have knowledge to share, and you may have an idea that none of us had considered, or that we can tweak to fit our situation. Let’s use this as a place of inspiration and ‘ata girls’! I had a couple of days that I was able to hang laundry out on the line instead of using the dryer. I’ve been turning off the furnace during the day every day for the last week save one, when it was rainy and windy. We’ve been turning it on first thing in the morning to take the chill out of the air (it’s usually down to about 64-66 degrees in the morning) but by 10am or so, I turn it off for the day, and don’t turn it back on until we go to bed, and at that point I set it at 62 just in case the wind picks up during the night and really chills the house. I tried the “no poo” method with my hair this week. I’m going to continue this for a few weeks and see where I’m at. We only had one small shopping trip this week. I picked my first daffodil this week and brought it in the house to brighten things up. I brought foam trays from veggie packaging to use as paint trays during craft time at homschool group. I turned off LOTS of lights the girls left on. I cooked a double batch of beans and then made a double batch of black bean soup with them so we could have it for dinner twice. I printed off some connect the dots sheets for Emma for free and put them in page protector sheets so they can be used over and over again. I found them here. We planted tomato and pepper seedlings a couple weeks ago and the tomato seedlings have started coming up! I made corn beef and cabbage with potatoes and carrots to share with Joel’s parents after church on Sunday. It was my first time making it. I cooked it in the crockpot so it would be ready after church and it turned out wonderful! Everyone loved it! I Cooked two chickens in the crockpot to use the meat for sandwiches, salads and dinners. I saved the bones and will be making broth with them probably tomorrow. I attended our church’s Ladies Night Out pajama party Monday night. I knew that one of the gals is gluten free, one was diabetic, and two others were doing a detox, so I made a gluten free, dairy free, sugar free chocolate pudding, and yes it is quite yummy! I also brought chocolate chip oatmeal cookies to share as well. We had a fun time as always! That’s all for me. What frugal accomplishments did you have last week? Well it’s a little over half way through our March Madness Terrell Style challenge, and I’m sure you are all dying to know how we’re doing! Well here it is straight folks. We made a couple of modifications, and got a little confused on the numbers a couple of times, and we skipped one day because we didn’t remember until midnight and were just too tired, but we are still going strong! I figured there are 31 days in March and technically it’s a 30 day challenge so we’re still good. To recap, we started a 30 day push-up and sit-up challenge March 1st. Really I’m the one who wanted to do it to help kick myself in gear, and my husband lovingly agreed to do it with me to help me with accountability. I also am trying to drink 8-8oz glasses of water every day. Here’s where we modified a little. I started out doing guy push-ups because my personal goal is to be able to do full on guy push-ups. I’ve switched to doing a combination of guy and girl push-ups. Basically I do guy push-ups until I can’t do any more and then I switch to girl ones. I get a sharp stabbing pain in my right rib cage after a few guy push-ups, so I’m hoping by just doing any kind of push-ups it will strengthen my upper body and eventually alleviate that. As far as the sit-ups go, we’ve switched to crunches. To be fair, this is what my husband wanted to do from the start, and is actually what is on the chart. I wanted to do full on sit-ups because I’m crazy like that. We’ll save that for another time, when we’ve been doing this for a while and aren’t starting from ground zero! And as far as the water drinking goes, I think I’ve been doing pretty good. I’ve been a little lazy the last few days keeping track, and yesterday was a big dud in the water drinking department, but for the most part I’ve done pretty good! And there you have it folks. We have 11 days left in our March Madness challenge, and I think we are going to end strong! How are you doing? What did you challenge yourself to do this month? It’s time for March Madness…Terrell Style! We here in the Terrell house are not really into following sports, of any kind really, so the March Madness craze doesn’t really effect us (unless you count the frustration of our favorite shows going MIA for 2-3 weeks, grrr.) I’ve decided to come up with our own March Madness. My “game” has been off ever since the holidays hit. In November and December, we not only have the usual holidays (Thanksgiving and Christmas), but we also have two kids with birthdays and at least one trip home to Nebraska for the holidays (this year was just one but some times we make the trip twice.) So now it’s march 1, and not only have I NOT lost any weight since the holidays, but I’ve GAINED (!!) several pounds back, ugh. I realized I needed a kick in the pants and just blogging about it isn’t enough. So I have enlisted the help of my dear husband. He and I are doing a 30 day push-up and sit-up challenge. My husband is skinny by nature, and never has been known to workout, but he loves me, and so he is graciously doing it with me so I have someone to do it with every day. I’m also striving to drink 8 8oz of water everyday for the next 30 days. Water is so good for you in SO many ways, and is great in aiding weight loss. I’ve been really bad about this in the past and am determined to develop this habit! Along with water I’ll be drinking Good Girl Moonshine. You can go to Trim Healthy Mama for the recipe. It has Apple Cider vinegar in it which has loads of health benefits, two being weight loss and appetite suppressant. It really does the trick and it doesn’t taste gross like you might think. I like mine with a couple dashes of cinnamon. I’ve been very loosely following the Trim Healthy Mama (THM) plan over the last year, but am really kicking it in gear now that Sammie (our second child) is on a gluten free diet nad I’ve been feeding her THM foods, which are gluten-free, and have been making enough for the two of us. We’ve also had a little more give in our grocery budget so I’ve been able to buy more on plan foods. I got totally off plan during the holidays, hence the reason I gained several pounds. But this mama says no more. You can buy the book from their website or from Trim Healthy Mama ” target=”_blank”>Amazon (affiliate Link). Joel and I have already done our push-ups and sit ups for yesterday and today. I think I met my water quota for yesterday, and am almost there today! It’s a good start. Two days down 28 to go. Wish me luck! March Madness Terrell Style is in full swing! Have you found yourself in a slump like I have? How about creating your own March Madness challenge? 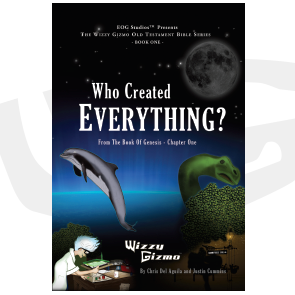 Review and Giveaway: Wizzy Gizmo-Who Created Everything? Today I get to share a review and giveaway of the book Wizzy Gizmo Who Created Everything? This review opportunity was made available through Home and School Mosaics. You can find more reviews on this book as well as other Wizzy Gizmo material at HomeSchoolMosiacs.com. The giveaway is being generously offered by the authors of the book, so a big thanks to you gentlemen! “Explore the wonders of Creation in this first book from the Wizzy Gizmo children’s Bible Adventure series. In the first book in the Wizzy Gizmo series, Wizzy and the kids get to experience what creation was like first hand thanks to the Bible being placed on the Gizmovision. Creation happens right around, above, and below them. A section of scripture is read aloud by the gizmovision, and than it unfolds before their eyes. To be honest guys, I haven’t done a review that I haven’t liked, but this has been the one my girls have been most enthusiastic about! They were excited when it arrived in the mail, they were excited when I told them we would be reading it for school, and they couldn’t wait until the next day when we would read a couple more chapters. They were bummed when we finished the book, and excited again when I told them I had the digital copy of the second book on my computer we could read (for review purposes only). It was so great to sit with my girls and read a book to them that painted such an amazing picture of what Creation may have looked like, taking it verse by verse, and day by day. I didn’t have to change the story or make things up because there was some evolution junk in it because it was all straight from the Word. The authors, Chris Del Aguila and Justin Cummins did an excellent job creating a storyline that could support the weight of Creation as recorded in the book of Genesis. So here are some fun facts about the books. Throughout the book you will find words in bold. These are vocabulary words. In the back you can find the list of vocabulary words and their definitions. As a homeschool mom, I jump at any opportunity for my children to expand their vocabulary so I like this added learning opportunity. At the end of the book is a list of review questions to help your children solidify the knowledge they just learned. Wizzy Gizmo Who Created Everything? ($12.99) is the first in the Wizzy Gizmo series. The second is In His Image ($12.99). And if you’re looking for audio books for kids Who Created Everything? ($9.99-$14.99) is also available as an audio book as well. If you’re a think ahead type of person, any of these products would make great Christmas presents. And shipping is always free on orders of $25 or more! Want to learn more about all the Wizzy Gizmo products? Head over to www.wizzygizmo.com and check them out! You can also find Wizzy Gizzmo on Facebook, Google+, Pinterest, Twitter, and Vimeo! So as you can tell, Wizzy Gizmo Gets a solid two thumbs up from this mom! Now that you’ve heard me rave about how great Wizzy Gizmo is, let’s have a giveaway! One randomly selected winner will win a copy of either the Wizzy Gizmo Who Created Everything audio book OR the Fast Track Bible Pack Cards! Oh man, am I excited for you guys! It’s easy, just leave a comment below telling us which one you’d like to win. Giveaway ends Friday, November 7th at 11.59pm Central. After a winner has been selected it will be announce on the blog as well as our Facebook page, and the winner will be emailed. You will have 48 hours to respond before a new winner is selected. The Winner of the Wizzy Gizmo giveaway is Melissa Ryun Lee! The material reviewed in this blog post were given to me for free in exchange for my honest opinion. My thoughts and opinions stated in the review are my own. Your results and opinion may vary. This blog post may contain affiliate links. Honestly people, this is how bloggers pay for our blogging bills (yes we do have expenses). Please know that I don’t become an affiliate for any company or product that I don’t like or would not use myself. Having said that, if you still have a problem with it simply type in the web address yourself. Well, it’s finally here. It’s time to put my money where my mouth is. This fall my eldest will start kindergarten and so begins my homeschool mom career. I graduate from seeing myself as a homeschool student to embracing the role of homeschool teacher. It’s exciting and overwhelming at the same time. I have all these ideas of projects I want to do with the kids that I’ve collected over the past few years, but putting ideas into action is a whole other bird. And lets not forget that it’s been 14 years since homeschooling has played any part in my daily life. Thankfully, I’m not left to the wolves to figure out what I’m doing. I am so fortunate and excited to be able to attend the 2014 Teaching Parents Associations Homeschool convention! It’s May 30th and 31st at the Century ll Convention Center in Wichita, KS, and you can check out TeachingParents.org to register. And I am SUPER excited to get to hear Tim Tebow’s mom Pam Tebow share with us from the wisdom she’s gathered over her many years as a homeschool mom as well as her ministry with her husband. I can’t say that I have too many expectations for the convention since it’s my first year, other than getting two days without kids to get recharged and fired up about the upcoming school year! I’ll be tweeting throughout the convention, highlighting some of the the amazing information and products I come across. You can follow me @ComingupGreen and I’ll be using the hashtag #TPAConvention. You can also follow me on Facebook! Are you going to a homeschool convention this year? Any tips for this newbie?! Hey all! Just wanted to take a few minutes and share with you a couple of blog posts I found this week that can help you save money. There are a lot of articles and blog posts out there that share tips to save money and lower expenses, but most of them site the same things over and over. For those of us who have been on the frugal journey for a while, it can be difficult and a bit frustrating at times trying to find new ways to trim the budget. 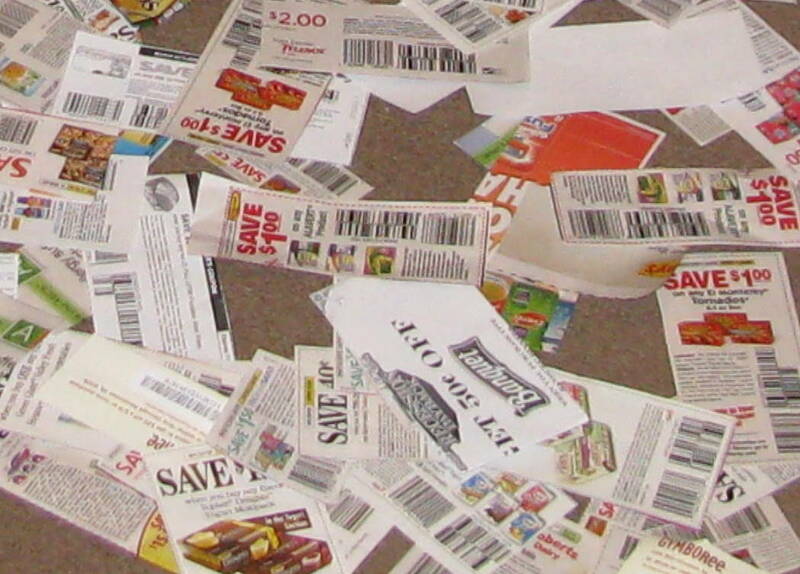 Two blogs that I follow recently shared their list of ways they save money for their families. The first is from Abbi at Proverbs 31 living. She shares 100 Ways You Can Save Money This Year. Abbi is always trying new things with her family. There are some things on the list that you probably have heard before or are already doing, but with 100 ideas I’m sure you’ll find several things to help you save money! I love the way they take little things and make fun experiences for their kids like using empty ketchup bottles filled with water and having water fights with them on hot days! The second list of ideas was shared by Brandy at The Prudent Homemaker. She gives some great ideas to help you save money in her recent post Cutting Expenses When You Think You have nothing Left to Cut. Brandy has a wealth of knowledge and experience when it comes to “trimming the fat” and making things stretch. Take some time and check out the rest of her site while you are their. You will be inspired and in awe! Do you have any great ideas or tips not found on either of these lists? What was your favorite idea that you plan on implementing? Let us know in the comments and be sure to share this with all your friends who are trying to save money! 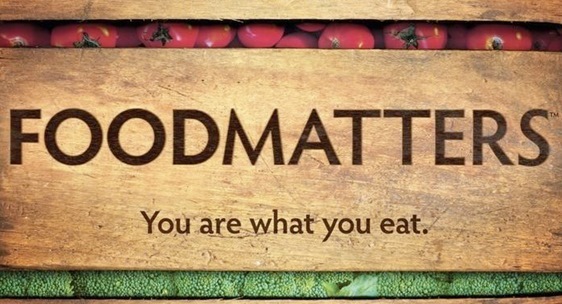 Right now you can watch the documentary Food Matters for free online through December 10th. Joel and I both love this documentary and highly recommend it to anyone who wants to feel better, healthier, stronger, and wants to stay out of the Doctor’s office. Food Matters discusses not just the types of food you put into your body but the quality of food as well. It also takes a look at what different kinds of foods do to you, for good or bad. I would strongly encourage you to take the time and watch this documentary if you haven’t yet. Have you seen Food Matters yet? What were your thoughts? Hi, my name is Libby. I almost never have time to do anything but throw my hair back in a wanna be bun and I’m even less likely to wear make-up. I don’t own any “cute shoes”, unless you consider my black low top chucks cute. If I’m lucky I remember earrings and a necklace, but it’s usually a rotation between the same three and I can’t tell you when they were actually purchased, actually they are mostly hand me downs from my mother (don’t worry, they are “classic” pieces.) You won’t see me with a cute scarf or outfit for that matter because I don’t own any to speak of. IF I paint my toenails it sticks around for months. On Sunday mornings I decide what I’m going to wear based on the last time I shaved. I’m not the put together Church-y mom. Sometimes I wish I was, but in reality most days I make my way through the church doors I just hope I don’t look like too much of a hot mess. Did I mention I’m the president of the women’s ministry at my church? I must admit, I don’t think I “look” very presidential. I am as real as it gets friends. Not to say that those who have figured out what works for them, fashion wise, aren’t real, I’m just saying I can only go up from here. It’s not like I had it and then lost it when I had kids. No, it just was never there. During my teen years I wore baggy XL t-shirts and men’s wide leg jeans to hide my body (which was amazing by the way, even though I didn’t realize it at the time.) I wanted to dress modestly and the best way I could think to do that was to have everything hang off of me. My hair was always pulled back because I didn’t know what to do with it. My senior year in high school I started to figure some things out but I still wasn’t great. Senor year spring missions trip. 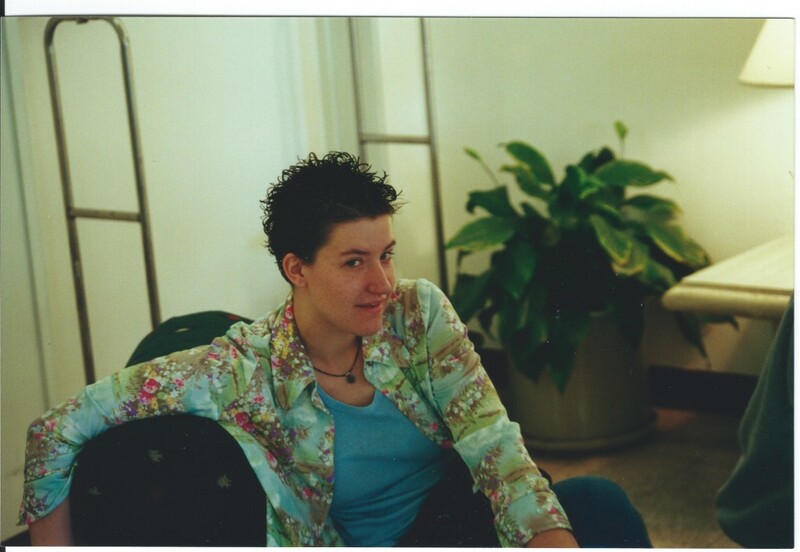 I was totally rocking my goodwill grandma poly shirt and my wide leg jeans. This was the first time I ever had any kind of confidence in my appearance. The thing is, I know what looks good. I just don’t have the money or the time to put it all together. Or there’s the fact that things don’t always “fit” for me. I l.o.v.e. boots. I have yet to find a pair of boots that will fit over my muscular calves. Then you have to consider the modesty aspect. I have set the modesty bar high in our house. Not everyone will feel it all necessary, but I do. I am the example to my girls of what beauty and modesty translates into. Sometimes I think I’m doing ok, most times I think I’ve got the modest part down, but not the creative expression and beauty part down. Shopping for modest, creative, and beautiful clothes can be so challenging that I give up and stick with the same old clothes I’ve been wearing for years. Often I feel like I’m conveying modesty survival mode. I hope and pray I’m not in this place forever. At some point God will provide the money for me to create a new wardrobe. I just pray when that time comes that I won’t run and hide because it’s so time consuming, or because it’s difficult to spend money on myself. Regardless, I don’t know that I will ever be that person who always looks put together. At the very least though, I would like to get it right for church and date nights. What’s the point of all this? I don’t know, other than you are ok right where you are at. And if no one else gets it or you, know that I do and you are not alone. You are beautiful and you are so much more than your hot mess outfit and hair. Have you ever walked out of the house after doing the best you could, hoping you don’t look like too much of a hot mess? Share some comment love below and help a girl feel less alone in her hot messness! Thanks for joining me in my mommy confession!